How many items are shown? If one picture is selected when you start ListView, then it assumes that you intend to select all the visible pictures. After all, why would you want a list of a single item? But if multiple pictures are selected, it assumes that you only want to list those items. There may be a short startup delay when you select a large number of pictures. This is because ListView gathers the metadata for all the selected items as it starts, which means scrolling through items becomes very much faster. The plug-in currently provides 3 different views. This is the larger view where each row has 4 lines of text per item and larger thumbnails, while compact and standard views show more rows but with smaller or larger thumbnails. Ideally ListView would have a simple scrollbar down the right, but the Lightroom plug-in interface doesn't permit this. So use the items buttons and slider to navigate by a page at a time or to scroll through the rows. To change what's shown in a column, click the column header and choose the field from the drop down box. Alternatively, select a choice from the Presets box. Notice the preset "Full Monty". This is a special preset which loads all metadata fields including custom fields defined by other plug-ins. Although they are not displayed, they will be exported. 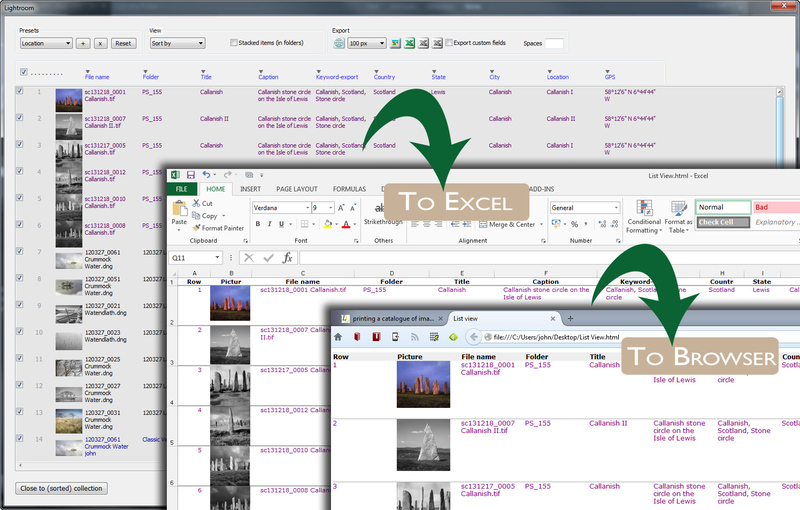 It's easy to export the metadata to Excel or a browser - just click either of the buttons at the top of the screen. To use a program other than Excel, or if Excel is in an unusual file location, go to File > Plug-in Manager where there's a setting which lets you choose which program will receive the data.